In many cases, high-quality code counts more than bells and whistles. Fast, reliable and well-maintained libraries provide a solid base for excellent applications built on top of it. Investing time into improving existing code improves the value of that code, and of the software built on top of that. For shared components, such as libraries, this value is often multiplied by the number of users. With this in mind, let’s have a closer look of how the Frameworks 5 transition affects the quality of the code, so many developers and users rely on. KDE Frameworks 5 will be released in 2 weeks from now. This fifth revision of what is currently known as the “KDE Development Platform” (or, technically “kdelibs”) is the result of 3 years of effort to modularize the individual libraries (and “bits and pieces”) we shipped as kdelibs and kde-runtime modules as part of KDE SC 4.x. 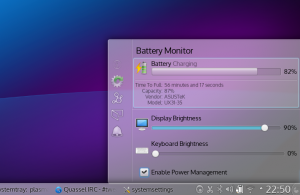 KDE Frameworks contains about 60 individual modules, libraries, plugins, toolchain, and scripting (QtQuick, for example) extensions. One of the important aspects that has seen little exposure when talking about the Frameworks 5 project, but which is really at the heart of it, are the processes behind it. The Frameworks project, as it happens with such transitions has created a new surge of energy for our libraries. The immediate results, KF5’s first stable release is a set of software frameworks that induce minimal overhead, are source- and binary-stable for the foreseeable future, are well maintained, get regular updates and are proven, high-quality, modern and performant code. There is a well-defined contribution process and no mandatory copyright assignment. In other words, it’s a reliable base to build software on in many different aspects. Extension and improvement of existing software are two ways of increasing their values. KF5 does not contain revolutionary new code, instead of extending it, in this major cycle, we’re concentrating on widening the usecases and improving their quality. The initial KDE4 release contained a lot of rewritten code, changed APIs and meant a major cleanup of hard-to-scale and sometimes outright horrible code. Even over the course of 4.x, we had a couple of quite fundamental changes to core functionality, for example the introduction of semantic desktop features, Akonadi, in Plasma the move to QML 1.x. All these new things have now seen a few years of work on them (and in the case of Nepomuk replacing of the guts of it with the migration to the much more performant Baloo framework). These things are mature, stable and proven to work by now. The transition to Qt5 and KF5 doesn’t actually change a lot about that, we’ve worked out most of the kinks of this transition by now. For many application-level code using KDE Frameworks, the porting will be rather easy to do, though not zero effort. The APIs themselves haven’t changed a lot, changes to make something work usually involve updating the build-system. From that point on, the application is often already functional, and can be gradually moved away from deprecated APIs. Frameworks 5 provides the necessary compatibility libraries to ease porting as much as possible. Surely, with the inevitable and purposeful explosion of the user-base following a first stable release, we will get a lot of feedback how to further improve the code in Frameworks 5. Processes, requirements and tooling for this is in place. Also, being an open system, we’re ready to receive your patches. Frameworks 5, in many ways encodes more than 15 years of experience into a clearly structured, stable base to build applications for all kinds of purposes, on all kinds of platforms on. With the modularization of the libraries, we’ve looked for suitable maintainers for them, and we’ve been quite successful in finding responsible caretakers for most of them. This is quite important as it reduces bottlenecks and single points of failure. It also scales up the throughput of our development process, as the work can be shared across more shoulders more easily. This achieves quicker feedback for development questions, code review requests, or help with bug fixes. We don’t actually require module maintainers to fix every single bug right away, they are acting much more as orchestrators and go-to-guys for a specific framework. More peer-review of code is generally a good thing. It provides safety nets for code problems, catches potential bugs, makes sure code doesn’t do dumb thing, or smart things in the wrong way. It also allows transfer of knowledge by talking about each others code. We have already been using Review Board for some time, but the work on Frameworks 5 and Plasma 5 has really boosted our use of review board, and review processes in general. It has become a more natural part of our collaboration process, and it’s a very good thing, both socially and code-quality-wise. More code reviews also keeps us developers in check. It makes it harder to slip in a bit of questionable code, a psychological thing. If I know my patches will be looked at line-by-line critically, it triggers more care when submitting patches. The reasons for this are different, and range from saving other developers some time to point out issues which I could have found myself had I gone over the code once more, but also make me look more cool when I submit a patch that is clean and nice, and can be submitted as-is. Surely, code reviews can be tedious and slow down the development, but with the right dose, in the end it leads to better code, which can be trusted down the line. The effects might not be immediately obvious, but they are usually positive. Splitting up the libraries and getting the build-system up to the task introduced major breakage at the build-level. In order to make sure our changes would work, and actually result in buildable and working frameworks, we needed better tooling. One huge improvement in our process was the arrival of a continuous integration system. Pushing code into one of the Frameworks nowadays means that a it is built in a clean environment and automated tests are run. It’s also used to build its dependencies, so problems in the code that might have slipped the developer’s attention are more often caught automatically. Usually, the results of the Continuous integration system’s automated builds are available within a few minutes, and if something breaks, developers get notifications via IRC or email. Having these short turnaround cycles makes it easier to fix things, as the memory of the change leading to the problem is still fresh. It also saves others time, it’s less likely that I find a broken build when I update to latest code. The build also triggers running autotests, which have been extended already, but are still quite far away from complete coverage. Having automated tests available makes it easier to spot problems, and increases the confidence that a particular change doesn’t wreak havoc elsewhere. A social aspect here is that not a single person is responsible if something breaks in autobuilds or autotests, it rather should be considered a “stop-the-line” event, and needs immediate attention — by anyone. This harnessing allows us to concentrate more on further improvments. Software in general are subject to a continous evolution, and Frameworks 5.0 is “just another” milestone in that ongoing process. Better scalability of the development processes (including QA) is not about getting to a stable release, it supports the further improvement. As much as we’ve updated code with more modern and better solutions, we’re also “upgrading” the way we work together, and the way we improve our software further. It’s the human build system behind software. The circle goes all the way round, the continuous improvement process, its backing tools and processes evolve over time. They do not just pop out of thin air, they’re not dictated from the top down, they are rather the result of the same level of experience that went into the software itself. The software as a product and its creation process are interlinked. Much of the important DNA of a piece of software is encoded in its creation and maintenance process, and they evolve together. In the Plasma team, we’re working frantically towards the next release of the Plasma workspaces, code-named “Plasma Next”. With the architectural work well in place, we’ve been filling in missing bits and pieces in the past months, and are now really close to the intended feature set for the first stable release. A good time to give you an impression of what it’s looking like right now. Keep in mind that we’re talking Alpha software here, and that we still have almost three months to iron out problems. I’m sure you’ll be able to observe something broken, but also something new and shiny. For the first stable release of Plasma Next, we decided to focus on core functionality. It’s impossible to get every single feature that’s available in our long-term support release KDE Plasma workspaces 4.11 into Plasma Next at once. We therefore decided to not spread ourselves too thin, and set aside some not-quite-core functionality for now. So we’re not aiming at complete feature parity yet, but at a stable core desktop that gets the work done, even if it doesn’t have all the bells and whistles that some of our users might be used to, yet. Apart from “quite boring”, underlying “system stuff”, we’ve also worked on the visuals. In the video, you can see an improved contrast in Plasma popups, effects in kwin have been polished up to make the desktop feel snappier. We’ve started the work on a new Plasma theme, that will sport a flatter look with more pronounced typography than the venerable Air, and animations can now be globally disabled, so the whole thing runs more efficiently on systems with slow painting performance, for example across a network. These are only some of the changes, there are many more, visible and invisible. We’re not quite done yet, but we have moved our focus from feature development to bugfixing, the results of that are very visible if you follow the development closely. Annoying problems are being fixed every day, and at this rate of development, I think we’re looking at a very shiny first stable release. Between today and that unicorn-dances-on-rainbows release lie almost three months of hard work, though, and that’s what we’ll do. While the whole thing already runs very smooth on my computers, we still have a lot of work to do in the integration department, and to translate this stability to the general case. Systems out there are diverse and different, and only wide-spread testing can help us make the experience a good one for everybody. Are your Qt builds going OOM? If you’re, like me, regularly building Qt, you probably have noticed a decent hunger for memory, especially when linking Webkit. This part of the build can take well over 8GB of RAM, and when it fails, you get to do it over again. Using the fallocate syscall (which works for newer kernels, but only for btrfs, ext4, ocfs2, and xfs filesystems), this can be done fast. In this example, I have enough space on my home partition, so I decided to put the swapfile there. It’s 4GB in size, which should be plenty of virtual memory to finish even the greediest of builds — your mileage may vary. If you’re not able to use fallocate, you’ll need a bit more patience and dd. This is just a really quick tip, more details on this process can be found in the excellent Arch Wiki. The metaphor of a home make-over crossed my mind today, and I think it implies a few ideas that connect to Plasma Next quite well. Plasma Next is a new iteration of the Plasma workspaces. This is the first time, that KDE’s workspace is released independently from its underlying libraries and the applications accompanying it. It is built upon KDE Frameworks 5 and Qt5. “Plasma Next” is our name for the development version of Plasma, the final product will not be called “Next”. The planned release does not include the applications that are shipped today as part of the KDE Software Compilation. Applications, just like the Frameworks follow a different release schedule. 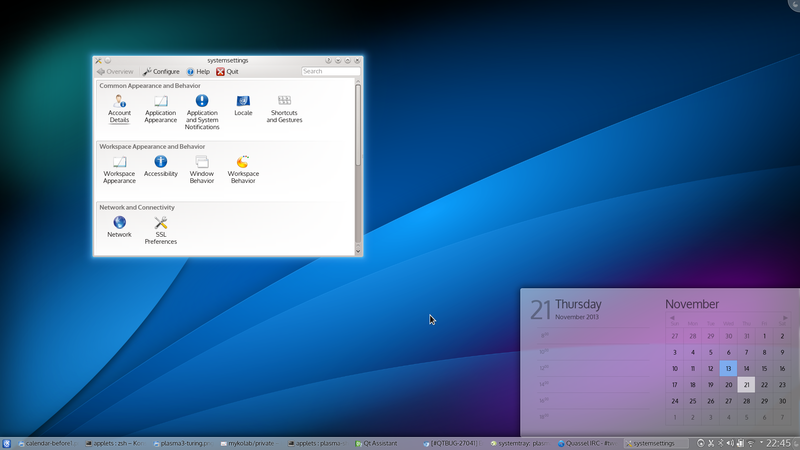 Of course it’s entirely possible to run KDE SC 4 Applications on a Plasma Next desktop, and vice versa. We have now settled on a release schedule for Plasma Next, which plans for the first stable release in June. It’s a good time to talk about what’s to expect in this first release. I think we’ve got some pretty exciting improved technology in the works. 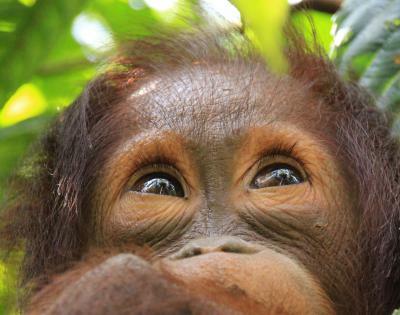 As our new baby shapes up, let’s take a look at what’s old and what’s new in more detail. Plasma Next bases on KDE Frameworks 5, which is a modularized version of the venerable KDE development platform, kdelibs and friends, so to say. This results in a reduced footprint in terms of dependencies. The Plasma libraries and runtime components are one of those Frameworks itself, providing the tools to build applications and workspaces. Plasma has been one of the early adopters of Frameworks 5, mainly for the reason that we had to do some development in parallel. While building on an unstable base wasn’t always easy, it certainly has its benefits: We could check the viability of the Frameworks goals, and catch regressions early on. A good test harness only goes so far, actually building a real world application with the libraries makes sure they’re stable and functioning. These days, the issues are gone, KDE Frameworks has stabilised enough that applications can be ported quite easily. With the move to Frameworks 5 come some architectural changes that allow us to cut out some “runtime fat”, we can get rid of some separate processes with the new architecture, which results in a leaner system for the user. 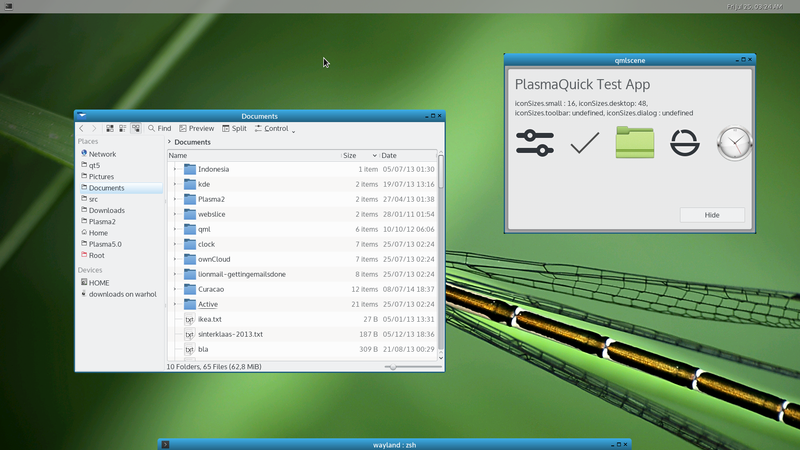 The transition to QtQuick reaches a very significant milestone in Plasma Next: the whole UI is written in QML. This concludes a transition process which we’ve started in Plasma 4.x, as a side-effect it solves a whole class of long-standing quality and maintenance problem in the code, it means a higher quality for many users. The transition to QtQuick-based UI has been fairly smooth so far, so we are not jumping onto something entirely new here, which means that we have been able to port much of the existing and matured functionality from Plasma 4.x over to Plasma Next. Our QML APIs have not changed radically, so porting existing code written in QML to Plasma Next is not a huge amount of work. For add-ons written in other languages (UIs written in C++, Python and other languages are currently not supported, this is a conscious design decision, and unless there are QML bindings for these languages (which seems like a weird idea), this is unlikely to be supported in the future. Instead we’ve improved and matured the QML API to a level where it’s very easy to create almost anything you can dream of in QML. Plasma’s graphical stack reaches a new state-of-the-art this year. We are now able to fully offload the rendering of the UI into threads, and other processes, making the UI responsive by default. We also offload visual effects almost entirely onto the graphics card. This means that it’s faster, so you get better framerates out of it, it frees up CPU time for the user and it’s also more energy-efficient, so saves some battery life. In case the system falls back to software rendering, we can now centrally disable animations, so even on systems that paint slowly, or we can reduce repaints drastically to give a snappy feel. This means that the visual effects in the UI degrade gracefully with available graphics features on the system. For the vast majority of users, this isn’t an issue anyway, their systems run a fully hardware-accelerated desktop with complete ease. On these systems we can improve the user experience by using the graphics card’s capability — and not only that: The transition to QtQuick 2, which is part of Qt5 means that all the work at UI level can be offloaded onto the GPU as well. 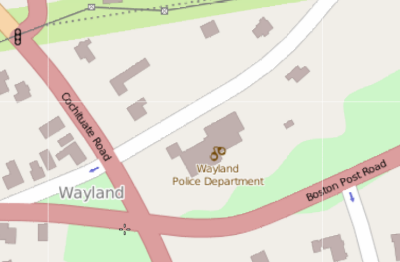 Another hot topic these days is Wayland readiness. This is currently work in progress, Martin Gräßlin’s blog shows some impressive progress on running KDE applications on Wayland. This is one of many important milestones. The most complex case is running a full Wayland session with Plasma and KDE applications, and we are not there yet. Wayland support is continuously improved. Next to these architectural changes, we’ve also put some work into the actual UI visuals and interaction. We are in the process of establishing a Visual Design Group in KDE. Which already participates in the development of Plasma Next. The first results of this will be visible this summer, and the group is currently hashing out plans for the future. There is some serious design love appearing. You can follow the progress of it on the wheeldesign blog. One of my favourite new features that has recently landed is Marco’s work on contrast behind translucent dialogs, which hugely improves readability in many cases, and make “the old Plasma” almost look bland in comparison. We’ve cleaned up quite a lot of workflows, not by making them any different, but by removing visual noise in between. The idea is to polish common elements to feel fresh and like an upgrade to users, but not entirely different. In the UI, known behavioral patterns are kept in place, with more pronounced core functions, and less fuzz around them. We’re aiming at keeping all the functionality and adaptability in place. To the user, the migration to Plasma Next should feel like an upgrade, not something completely new, but trusted after a bigger step in its evolution, yet recognizably true to its values. We want to achieve this by concentrating on the core values, on what makes us good, and what users love us for. But we also do not want to pass the opportunity to fix what nags us and our users. Improvements in details mean that we listen to our users, a large portion of which do not want to be the subject of UI experiments, but who require a reliable system that supports and improves the personal workflows they have almost brought to perfection. Of course, all of these workflows rely on many details behaving as they do, and these things are different for everyone. A small difference in behavior, or a missing seemingly minor feature might make or break any given workflow, there is no guarantee to be made, just a promise of best effort. 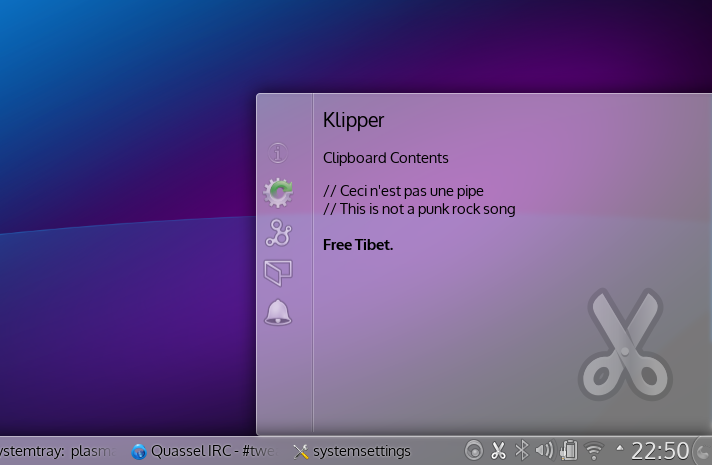 Many, but not all parts are co-installable, and it will be possible to use KDE SC 4 applications in a Plasma Next environment, and vice versa. Plasma Next runs on top of a device-independent shell. The whole UI is structured into logical blocks that can be exchanged at runtime, this allows for dynamic switching the user interface to suit a different form factor. A target device will typically have the plasma-shell (and runtime bits) installed, and one or more device-specific shells. We are now readying the first of these “workspace user experiences”, Plasma Desktop. Others, such as the tablet-oriented Plasma Active UX will join in subsequent releases. When will it be good enough for me? While no .0 will ever be perfect, I expect that Plasma Next.0 will feel very much like an evolutionary step to the user, and certainly miles away compared to the impact of Plasma in KDE 4.0. For those that still remember the transition from KDE 2.2 to KDE 3.0, this seems rather comparable. While KDE 2 was almost a complete rewrite of KDE 1, the 2 to 3 transition was much less radical and far-reaching. We saw the same pattern between KDE 3 and 4, which again was quite radical, especially in and kdelibs and even more so for the workspace — Plasma which was completely new in 4.0. In the first stable release of Plasma Next we want to provide a stable and fully functional core desktop. We concentrate on making the most important default functionality available, and are polishing this first and foremost. I expect that most users can be just happy with this first release, but as I said, there’s no guarantee, and maybe you’re missing something. For those that want to make the switch later, we have of course our long-term maintained current Plasma stable, so there’s no rush. This concentration on the core also means that not every single feature will be available immediately. We are, however aiming at feature parity, so in most cases, a missing feature in .0 will be brought back in a later release. 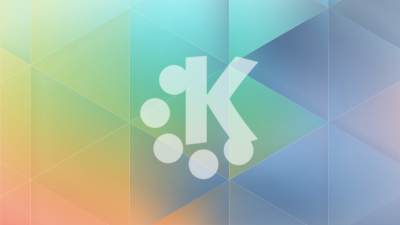 The kdeplasma-addons module, which contains additional functionality will likely not be ported by summer. Ultimately, the way to make a good Plasma Next happen is to lend us a hand and take part. Even better, you don’t have to wait with this until summer. Take the plunge, build KDE Frameworks 5 and Plasma Next, try it and help us completing the core functionality and to fix bugs. That is exactly what we will be doing in the next months leading up to the release this summer, and we hope the experience will be delightful one for our users. In this article, I’m describing a way to dynamically load Plasmoids into the systemtray. 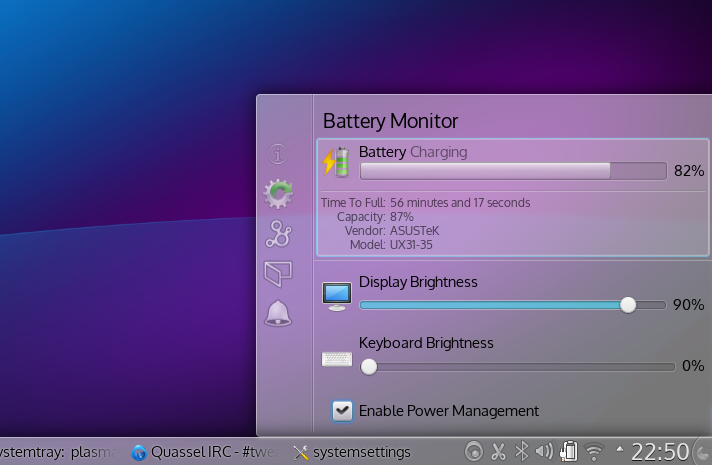 It’s interesting for you if you develop Plasma addons, or if you’re interested in the design of Plasma by KDE. One of the wishes that came up during the latest Plasma sprint in Barcelona was a more dynamic way of showing functionality in the systemtray, that little notification area sitting in the panel next to the clock. The systemtray can have different kinds of “things” in them: Statusnotifiers, which are basically systray icons of applications, and Plasma widgets, which allows for much more functionality and freedom in UI development. Statusnotifiers are instantiated by applications, so their lifetime is entirely in the hands of the application they belong to. For Plasma widgets, this is a bit different, they’re currently loaded on startup. Ideally, we want to load specific services on-demand, say when a specific service becomes available. This feature allows loading and unloading Plasmoids when dbus services come and go. Applets can specify in their metadata which service should control their lifecycle. That’s all. Enjoy your cleaner, more dynamic systemtray! We are currently looking into how we can improve Plasma (but in extension also other applications, including QWidget-based ones) on hardware that sports unusually high DPI (also called “reasonable DPI”). In this article, I’ll outline the problem space and explain our tools to improve support for high DPI devices in Plasma. First, let’s take a step back, however, to explain the problem space to those who haven’t yet spent that much thinking on this. Most of today’s desktops and laptops have have roughly the same amount of pixels per square inch of screen space. The amount of pixels per inch is measured in DPI (dots per inch) or PPI (pixels per inch). This value is around 100 DPI for laptops. Tablets and smartphones are already available with much higher DPI screens, making for sharper fonts and overall higher fidelity graphics. A while ago, Apple has started producing laptops with high DPI displays as well, these are the so-called Retina screens. There are Macbooks on the market with 220 DPI. Some people have complained for years about the low DPI value of screens available on the market (and I am one of them), higher DPI simply allows for nicer looks, and reduces the need for “dirty tricks” such as subpixel rendering algorithms (which come with their own set of problems). Graphics chips also have become fast enough (and with enough memory) to not have a problem with high resolutions (think 4K on your laptop, for example). I’ve done some research (Well, lazy-webbing, mostly), and it seems that higher DPI screens for desktop systems, but also for laptops are still quite rare, and when you find one, they’re often really, really expensive. I believe this is caused by two reasons: production-line quality is not always good enough to produce high DPI screens, one could say that the more pixels there are on a given device, the higher the chance that one or more of them are dead, making the display unsellable, and thus increasing the price of the ones that are pixel-perfect. Also, tablets and smartphones, which often already sport high DPI screens are currently taking up almost all of the production capacity. The obvious result is scarcity and a high price. I believe it’s only a matter of time until high DPI displays become more common, however. A few friends of mine already have high DPI displays, so there is a real need to support this kind of screen well. For graphical elements, this is a real problem, but less so for text. Today’s text rendering engines (Freetype, for example) take the DPI value of the screen into account. This means that this at least partly solves our problem. Luckily, it solves the problem for very complex cases, so at least this is not of great concern. It’s only a partial solution, however, so this at best eases finding a complete solution. We need to fix these problems in different areas, and all need to have well-thought out solutions. This means that taking the font height as rendered, we actually can compute values for sizing elements that not only take the low-level technical properties of the hardware into account, but also user preferences (or system presets). In Plasma 2, we started using this mechanism in a number of places, and so far we’re pretty happy with the results. Some examples which where we use this is the sizing of popups coming out of the panel (for the notification area and the calendar for example), but also the sizing of the icons in the notification area (or system tray). This means instead of hardcoding pixel sizes, these UI elements grow and shrink depending on your settings. This solves a part of the problem, but is obviously not a complete solution. If you would like to implement this mechanism, here’s two snippets of code, which, with some necessary adaption, you can use to make your app work well on High DPI devices. We’ve bridged this API in the Plasma Theme class, which is available from QML applications by importing org.kde.plasma.core (the global property theme will be automatically set, which allows you easy access to Plasma::Theme from everywhere, in case you’re wondering where the “theme” variable is coming from). itself, so this is an approximation. In the second example, you see that we’re using another property, “units.largeSpacing” for the margins. This is another piece of DPI-dependent UI which you can use to apply margins and spacing that take DPI (actually font-as-rendered-settings) into account. To get the size of a piece of text on the screen, in QtQuick code, you can use the paintedWidth property of a Text elements, but not that this can be tricky due to text elision, line breaks, etc., so this is to be dealt with with care. Another interesting case which affects the usability of our graphcal interfaces on high-DPI screens is the sizing of icons. We are using standard sizes there, which you access via properties “units.iconSizes.small”, “units.iconSizes.large”, etc.. In Plasma, these sizes now get interpolated with the DPI value of the screen, while making sure the icons are still getting rendered correctly. The sizing is done in steps, and not linearly to avoid getting washed-out icons. This mechanism works well and automatically solves another piece of the puzzle. The result of doing this is a more balanced look and better alignment and spacing across some widgets (notably the battery gains quite a bit of beauty with this treatment). In other UI elements, especially the toolkitty widgets we provide in PlasmaComponents, we often already scale with the text, which works just fine for reasonably-but-not-excessively high DPI values. We have done some experiments with scaling up the graphical elements that are used to, for example, render a button. As we are using SVG graphics throughout the user interface, we don’t have to resolve to dirty tricks such as doubling pixels, and we can get quite neat results. This needs some more work, and it hasn’t been merged into master yet. Now, having discussed lots of technical details, how does the user-facing side of this look and work? The changes we’ve done right now only affect the user in one way: More UI elements scale with the DPI of the screen, this means no change for displays around 100 DPI. On my laptop (which has a 180 DPI screen), this gives a more balanced picture. As Plasma is making its way onto a wider range of target devices (think tablets, media centers, as well as high-dpi laptops or monitors), this topic becomes increasinly important. I have good hopes that we will be able to solve this problem in a way that really leverages the power of this kind of hardware. In Plasma Next, we’re now providing some of the basic tools to make UIs work well on high-DPI displays, and we’ll continue this route further on. The user will notice that in Plasma Next, most of the problems that could be seen on high DPI screen are gone, and that the whole behaves much better without many tricks. Two areas in particular are catching my attention these days, the notification area (“system tray”, that row of icons which show you the status of all kinds of things), and the clock with its calendar popup. The calendar shows quite nicely some things we want to pay attention to in Plasma 2: consistency and elegance. We are making more use of pronounced typography, are fixing alignment problems, and are looking for a generally more elegant way of presenting the common functionality. In that, the plan is not to make a lot of changes to the functionality itself, not cutting down the UI, but polishing what is already there. By reducing the workspace’s mental friction for the user makes the tools take a step back and give more room to the content and interaction that is presented. Doing that, the workspace should be functional, yet elegant. The migration should feel like an upgrade of something familiar. We want to make it functionality-wise equivalent, but more polished. On top of that, we’re readying the technology for future use cases, and evolution of the underlying technology stack. QtQuick 2 actually makes these things a lot easier, as it is much more correct in terms of calculating font metrics reliably, which we need to (sub-)pixel-perfectly align text and other UI elements. Trying to make this exact in Qt4 and on top of QGraphicsView was a shortcut into madness. Ever so slightly off font metrics, and wonky layouts get you to tear your hair out pretty quicky. This is much better now, (though certainly not perfect in all areas), so it allows us to finally fix these jarring little mis-alignments that nag the eye. The calendar already does it pretty well, and serves as a nice example. This implementation takes the physical size of the pixel on the screen into account by correcting for DPI in the whole layout, so it works nicely on all resolutions and pixel densities. With higher pixel-density displays, the rendering gets more details, fonts look neater, but the size of interaction areas, and the effective size on the screen don’t change much. The screenshots have been taken on a 170 DPI display, so if the fonts seem huge on your display (or small, as I hope for you), this would be the reason for that. In the notification area, you might notice that the widgets that have been living in there are now contained in the same popup. This results in less window management and layering of small popups in the notification area, clearer navigation and a cleaner look. The currently active icon has slightly pronounced visuals compared to the others. The calendar will of course show information about tasks and agenda (this part doesn’t work yet). One neat thing which the new architecture allowed use to do very easily is lazy-loading the calendar. As just loading the calendar can result in quite a bit of loading underneath, delaying to loading it on-demand speeds up start-up time and lowers memory consumption in a lot of cases. Plasma 2 is a converging user interface. It allows to control the Look and Feel at different levels. On the lower level / higher detail side of the scale, we look at adjusting input areas, sizing of ui elements, and interaction schemes by swapping out and “overriding” parts of the UI toolkit with, for example, touch friendly versions of widgets. On a higher level, we support laying out the furniture of the workspace (think of alt+tab window switcher, log in, lock, etc. features) by more code sharing and a different logic to how they’re loaded (and swapped out). Plasma shell allows dynamic switching of shell layouts at run-time. The shell is equipped to morph between workspace presentations, so should your tablet suddenly get a keyboard and mouse plugged in, it changes its disguise to a traditional (actually your own customized) desktop layout. While this is cool, in reverse, it allows us to isolate changes that are done to suit other devices from the “Desktop Experience”. Just because the workspace support multiple devices, the user doesn’t get the lowest common denominator, but specialization. Different devices are different for a reason, and so should the UI be. “Mobile-friendly” shouldn’t mean “misses features”, but “responsibly designed” (excuse the pun). Our tricks allow to use the same system on a range of devices, with the user interface adopting to specialties of hardware it runs on, such as input, display, but also usage scenarios specific that device. Much like the Linux kernel, which “mostly figures out how to run properly in a device it’s booted on”, and which can be configured as small and as big as one wants, the user-interface uses “UI plugins” at different layers, and detects changes and adopts to the form factor. You use a media center “driver” if you want to use it on the TV in your living room, you use a tablet “driver” on your tablet on the go, you use desktop driver on the laptop, and you can switch the device’s UI when needed. Laptop or tablet + HDMI cable ~= media center, isn’t it? You see, many different construction sites. We’re working a lot on all these things and you should definitely consider joining. Nothing is set in stone yet, and you should consider the imagery functional mock-ups, rather than the final thing. It’s not perfect and lacking in all kinds of places, it even crashes in some and what is presented is just a snapshot of work in progress. Many details remain to be hashed out. Still, I’m running Plasma 2 about half of the time on my laptop now. It’s just about to be becoming usable and almost dogfoodable for more than just a very small handful of people with an elevated pain threshold and a debugger at hand. “When?”, I hear you ask. 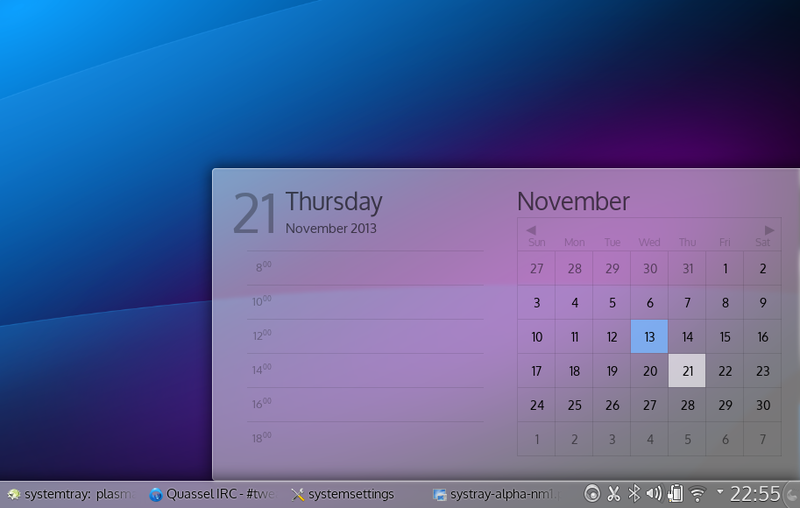 We’re aiming at a stable, end-user ready release of the new Desktop shell in summer 2014, at the end of Q2. On of the next milestones will be a tech-preview, which is planned for mid-December, so just about a month away from today. From December, where we’ll reach the point of having the basic functionality in place, we’ll spend time on filling in the missing bits, making sure everything runs on Wayland, and on polishing and quality improvements. Integrating additional workspaces, such as Plasma Active and Plasma MediaCenter are also next year’s roadmap. These will become the tablet, resp. media center drivers.